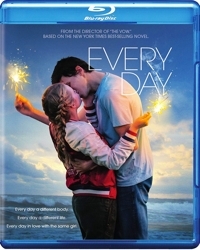 The Fault in Our Stars (2014) was such a huge hit that you knew other sick teen romantic dramas would follow, even if you were unaware of what books were out there to inspire the screenplays. 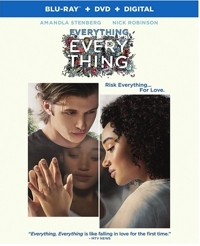 And sure enough, along comes Everything, Everything (2017), starring Amandla Stenberg (The Hunger Games) and Nick Robinson (The Kings of Summer). If there’s a teen in your family, they’ve no doubt seen trailers or heard of it. But they may not know about the one big difference between the two “sick teen” romantic dramas: The Fault in Our Stars aims high, for an adult audience as well as teens, with believable dialogue and situations and an edginess that comes from a healthy cynicism that comes from a realistic optimism in a hopelessly pessimistic situation. It’s a little like Hemingway for teens, where grace under pressure and how well you face tragedy becomes more important than the outcome. It’s about finding consolation in an impossible situation. Everything, Everything is the flip side of that—a film that doesn’t just look for a silver lining, but manufactures one. It’s made for the people who wept during The Fault in Our Stars thinking, Why? Why couldn’t there have been just a slightly happier outcome? 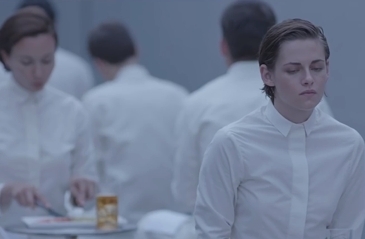 Kristen Stewart and Nicholas Hoult in a dystopian romantic drama? Sounds like a surefire hit with teens, doesn’t it? Especially when it’s all about emotions, as Equals is. 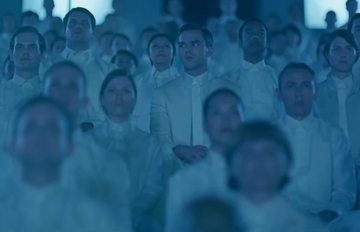 When Silas (Hoult) is affected, he goes through treatments. 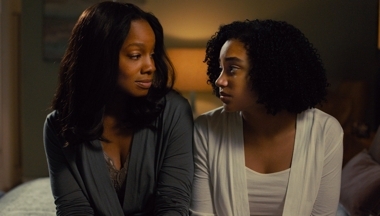 He also suspects that co-worker Nia (Stewart) is suffering from SOS but hiding her symptoms. The main symptom, of course, is that they can feel emotions and therefore notice each other, then feel for each other. A romance grows . . . though unfortunately, not fast enough for most teens. Therein lies the chief problem. How do you convey a sterile and emotionless environment and a futuristic existence bereft of real meaning without subjecting viewers to stark repetitive images and what feels like real-time boredom? 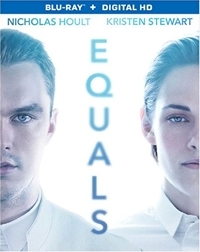 Thirty minutes into Equals our dystopian-novel-loving teen was ready to pull the plug, and I can’t say as I blame her. It’s slow going. What’s worse, though, is that if you’ve seen The Giver, or even Gattaca, you’re already have a slight sense of deja vu. The concept isn’t new or original, and that places a burden on director Drake Doremus and his cast to make their version of dystopian disappointment memorable or distinctive it in some way. And I’m not sure that happens. Doremus seems to wrestle with the sense of inevitability that’s embedded in the film’s plot, determined to shine the spotlight on these ill-fated lovers when what’s more interesting, frankly, are the other patients who have formed both a support group and underground movement to deal with not just SOS but their newfound “knowledge” of emotions that feels a little like the problem Adam and Eve faced after tasting of knowledge in the Garden of Eden. Is Equals stylish? Yes. Is it cold and sterile? Yes. Is it satisfying to watch? Honestly, no . . . though things really pick up in the third act when SOS patients played by Guy Pearce and Jacki Weaver both literally and figuratively try to come to the rescue. By then, though, many viewers—young ones especially—might feel a little too zombified themselves to care. While watching Pride and Prejudice and Zombies, our college freshman groused that you can’t introduce the Four Horsemen of the Apocalypse and then not do much with it. “D for dumb” was the grade he said he’d give the film. Our teenage daughter, who’s more the target audience, said she thought it was a B but admitted it wasn’t as good as she had hoped. My wife, a big Jane Austen fan, agreed. She liked that, minus the zombie sequences, the historical drama stayed fairly close to the book, but she didn’t think this particular Darcy (Sam Riley) charismatic enough to sell the romantic angle. As for me, I found myself less impressed by this variation on a theme than I was by the Bollywood version, Bride & Prejudice. 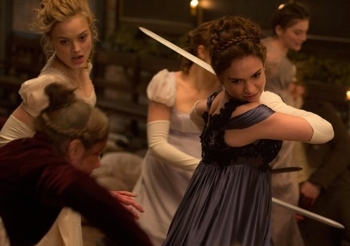 If Pride and Prejudice and Zombies disappoints—and my family wasn’t alone, given that only 42 percent of Rotten Tomatometer critics liked the film—let me suggest one main reason why. It’s a romance and it’s an action-horror film, and sometimes one genre gets in the way of the other. The concept works against itself. Though the zombie premise is woven into the plot, the actual insertion of zombie scenes can sometimes feel inorganic or heavy-handed. Hearing myself say that I have to chuckle: of course when you insert battles with zombies they’re going to be jarringly head-snapping (sometimes quite literally). But it does take away from any romantic simmer, and the dramatic, romantic interludes are just enough to make people squirm and wish for more zombie action. I think my daughter nailed it when she said the characters and the historical treatment were good, but the writers could have done more with the plot and included more action. As much as she loves romance, she’s a fan of shows like Supernatural, and the action-violence in Pride and Prejudice and Zombies is both tame and minimal by comparison. Disappointing, in other words. The novel by Seth Grahame-Smith was a parody, but the comic elements seem diminished in this film adaptation from director Burr Steers. In it, Darcy is like a 19th-century version of Homeland Security. In the opening scene, he visits a rich family to expose a rumored, recently infected zombie that, if unchecked, might start another mass outbreak. Meanwhile, Mr. Bennet (the incomparable Charles Dance) sends his daughters to China to learn martial arts and better defend themselves against those pesky zombies, who seem to have no social graces—turning horseback rides and elegant balls into tests of survival. You’ll probably need to watch this film several times to grasp an appreciation of the IZS (Integrated Zombie Structure), which includes a trip to the In-Between zone outside of walled London in which zombies feed on pig brains and are somehow kept from going completely savage. Ala Austen there are proposals and good and bad manners. The handsome Mr. Bingley (Douglas Booth) is here, of course, as is Parson Collins (Matt Smith), himself a suitor who indeed “settles” after being turned down by his first choice. And a soldier named Mr. Wickham (Jack Huston) turns up with a story about Mr. Darcy that he’s reluctant (but dying) to tell. And in this version, Darcy’s aunt, Lady Catherine, is a famous zombie killer who wears an eye patch and seems resistant to any idea of a brokered peace with zombies that haven’t gone savage. Got that? As the main character, Elizabeth Bennet, Lily James (Cinderella) charms not only all the suitors but teenage girls who will recognize in her that rare combination of natural behavior and poise. Without her, this film would languish a lot more in the IZS. 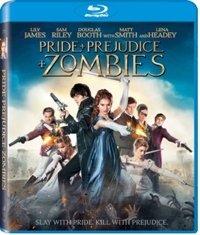 Pride and Prejudice and Zombies took in a worldwide gross of just $16 million against a reported $28 million production budget, despite plenty of advertising and social media buzz. It could be that Austen fans expect romance to be at the core of this classic, no matter what the permutation, and zombies ate away a little too much of that chest-heaving unrequited love. Takeaway: Could have been funnier, could have been more romantic, and could have had more zombie action to satisfy those with a craving . . . . Here are four words you have to keep in mind when watching A Royal Night Out: “Inspired by True Events.” In Hollywood, that means a wholesale revision of the facts, if not a pure fiction. 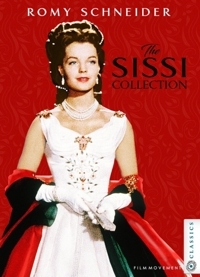 So this 2015 historical comedy-romance-adventure is truthful when it says it’s only inspired by the story of Princesses Elizabeth and Margaret being allowed to venture incognito outside the gates of Buckingham Palace on V.E. Day to listen to their father’s speech from the other side of the fence. Twentieth Century Fox quite accurately describes it as “a fanciful tale about two real-life princesses who long to feel normal on the most extraordinary night of their lives.” While critics have taken this WWII-era film to task for its blatant historical inaccuracies and eyebrow-raising plot, I feel compelled to say, Relax. This isn’t The King’s Speech. It’s Adventures in Babysitting meets Roman Holiday. 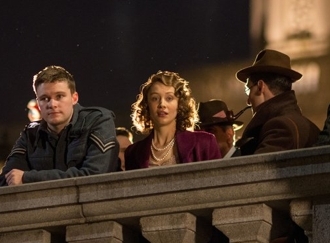 The action takes place on a single night in which all of London is euphorically celebrating Hitler’s demise and the end of the war in Europe. 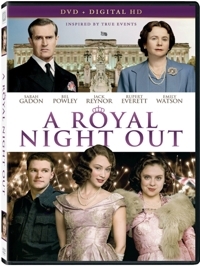 After the king (Rupert Everett) countermand’s the queen (Emily Watson) and gives his daughters permission to leave the palace on the condition that they report back to him what the “real” people have to say about him and his speech, the sensible Elizabeth (Sarah Gadon) and her wild younger sister Margaret (Bel Powley) leave the gates with two military chaperones. They think they’re headed for a night on the town, but at the king’s orders the escorts drop them off at a stuffy hotel ballroom celebration with England’s upper-crust old fogies the only ones in attendance. But, tempted by women and liquor, the chaperones decide to leave their post at the closed door and watch from afar. Of course Margaret manages to slip out first, and then Elizabeth, with the latter’s entire night spent trying to track down and take care of her wild but naive sister, who drinks her way across London with a group of naval officers that has no idea she’s the princess. To catch up with her Elizabeth boards a bus and, having no money for fare, is about to be tossed off when a young R.A.F. bomber seated next to her offers to pay. From that point on, he becomes her reluctant, unwilling, and finally devoted accomplice as the two of them continue their pursuit of Margaret . . . and of course draw closer to each other in the process. A Royal Night Out is fast-paced fun if, like the princesses, you allow yourself to get swept up in the manic euphoria of one of history’s biggest celebrations. Director Julian Jarrold (Becoming Jane, Brideshead Revisited) and his set and costume designers do a fine job of selling the period atmosphere, and the cast is perfectly charming. It’s the kind of film that princess-crazy daughters would love, if their own kings and queens would let them watch. Be aware, though, that there’s celebratory drinking, drunkenness, some brawling, hookers, opium dens, and overly aggressive military men. Takeaways: Surprisingly fun. Hollywood loves to project the longing that royalty has for a “normal” life, but I’d bet it’s nothing compared to the longing that “normal” people have for leading a life of leisure and luxury. Just sayin’. Only Disney would have the audacity to attempt a live-action remake of an animated classic, and to play it fairly straight as a romantic drama—with even less comic relief than the original. And only Disney could pull it off. 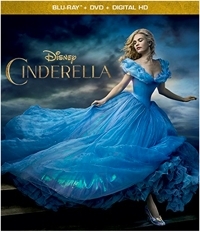 Everyone knows the story of Cinderella, so it’s really a matter of how the story is told. I think the studio made the right call. They decided to craft an origin story: to fill in the information gaps, to flesh out the characters, and to focus on the romance. The devil is in the details, but details—and devilish characters, for that matter—have always been Disney’s strong suit. 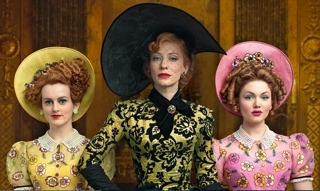 Cate Blanchet plays the stepmother with the same complexity as Angelina Jolie’s Maleficent, the backgrounds are as striking as anything you’ve seen in The Lord of the Rings trilogy, and the interiors of this live-action feature rival what we saw in Disney’s animated Beauty and the Beast. I wouldn’t say the CGI elements are seamless—you can certainly tell that the lizards and mice are computer-generated—but they’re cute as the Dickens. Scottish actor Richard Madden (Klondike, Game of Thrones) plays the Prince, but Lily James (Downton Abbey) is even more charming as Ella, nicknamed “Cinderella” by her stepmother after she’s found lying next to the hearth to keep warm. It’s easy to become as captivated by Ella as the Prince is, enthralled by her fresh optimism and live-by mantra: to have courage and to be kind. In other words, Cinderella has an inner strength and beauty to complement her physical good looks, and Disney drives home the point that what’s inside matters more. 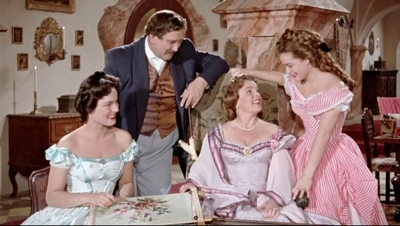 The screenwriters also are mindful of the Disney princess “brand” as they suggest that while little Ella wasn’t royalty, she was a princess to her mother and father, who loved her very much. And Disney being Disney, death is handled matter-of-factly. “Way of all flesh, boy,” a dying father tells his offspring. If there’s a surprise, it’s that the live-action stepsisters (Sophie McShera, Holliday Grainger) aren’t as broadly comic as they’re often played, and that the fairy godmother is played a little more comically by the incomparable Helena Bonham Carter, who has as much fun with this role as she did playing Disney’s Red Queen in the live-action Alice and Wonderland. In this version of Cinderella there’s much more development of the Prince and his relationships. We see him interacting with a captain of the guard (Nonso Anozie), a manipulative Grand Duke (Stellan Skarsgard), and his father, the King (Derek Jacobi). Collectively those interactions make the pair’s coming together more satisfying, and more than anything else the live-action Cinderella is a grand romance that does for this fairy tale what Neuschwanstein Castle—the inspiration for Disney’s theme-park castles—did for all of them: it celebrates the magic, the majesty, and the happily-ever-after ending that everyone, deep down inside, still craves. The characters, the story, and the wonderful details will make this a repeat play, no matter how familiar it is. Don’t hesitate to add it to your collections. You may know the story, but, like Hoosiers, it’s somehow rousing every time you watch. Get it in Blu-ray combo pack to enjoy a flawless and room-filling DTS-HDMA 7.1 soundtrack (which, surprisingly, is song-free except for one number that Ella and her mother sing) and a gorgeous-looking 2.39:1 widescreen presentation that really pops in HD. 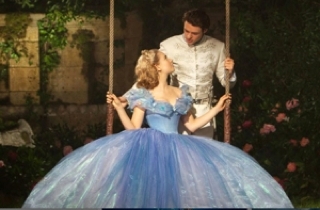 Takeaway: Disney is still king when it comes to bringing grand romances and fairy tales to life on the big screen.